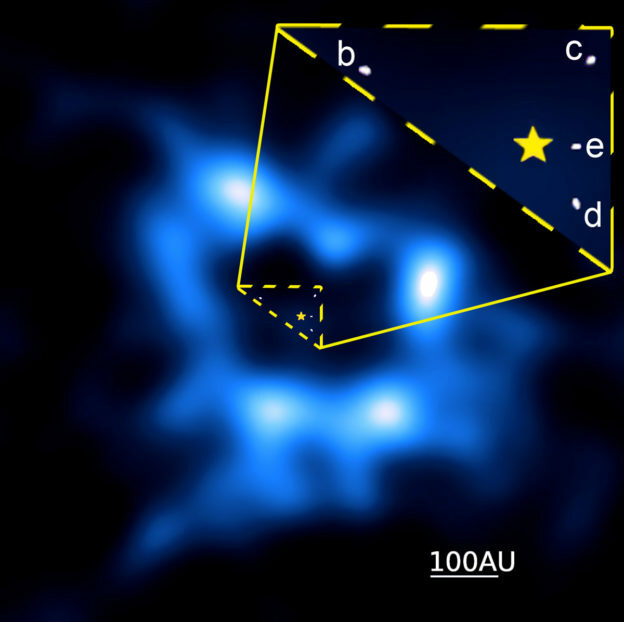 ALMA has imaged a broad band of dust and pebbles around a distant star. There’s one problem, though: the inner edge of the band lies further away from the star than expected. The discovery may hint at the presence of an as-yet-undiscovered planet. The star (HR 8799) is known to be accompanied by four giant planets. The planets have even been photographed, using large optical telescopes. In pictures made a few years apart, you can see how they orbit their parent star – it’s a real nice ‘solar system’. Our own solar system contains not only planets, but also dust particles, rocky objects (asteroids), and chunks of ice (comets). In fact, beyond the orbit of Neptune lies a broad band of icy bodies and dust, known as the Kuiper Belt. The ALMA observations reveal that HR 8799 has its own Kuiper Belt. ALMA has detected the millimeter radiation of millimeter-sized dust particles. These particles are produced when comet-like bodies smash into each other. The Kuiper Belt of HR 8799 has an inner edge at some 22 billion kilometers from the star – 150 times the distance between the Earth and the Sun. The outer edge of the belt is at some 63 billion kilometers (420 times the Sun-Earth distance). It’s a nice result, but there’s a problem: astronomers had expected the inner edge of the belt to lie much closer to the star. The belt should really start just outside orbit of the outermost planet of HR 8799 (known as planet b), just like our own Kuiper Belt starts just outside the orbit of Neptune. Planet b is orbiting at 10.2 billion kilometers from the star (68 times the Sun-Earth distance). Astronomers are not sure why the star’s Kuiper Belt lies so far away. It may be that there is yet another planet orbiting the star, even further away than planet b. Future observations by large telescopes on the ground or in space may possibly reveal this planet. HR 8799 is a star at 129 light-years in the constellation Pegasus, the Winged Horse. The star is relatively young: just 30 million years or so. It is brighter and about fifty percent more massive than our own Sun. In 2008, astronomers discovered three giant planets orbiting the star. A few years later, a fourth planet was discovered. Apart from the planets, the star is also encircled by a belt of warm dust (close to the star) and a ‘Kuiper Belt’ of icy bodies and cold dust, beyond the orbit of the outermost planet. Mark Booth of the Pontificia Universidad Católica de Chile led the team that carried out the ALMA observations of HR 8799. To obtain the sharpest possible images, ALMA was used in its compact configuration, with the 66 dishes as close to each other as possible. Mark’s team members were astronomers from Chile, the United Kingdom, and the United States. They published the new results in a professional magazine known as the Monthly Notices of the Royal Astronomical Society.